Below you can view all the homes for sale in the The Reserve At Somerset subdivision located in Bargersville Indiana. Listings in The Reserve At Somerset are updated daily from data we receive from the Indianapolis multiple listing service. To learn more about any of these homes or to receive custom notifications when a new property is listed for sale in The Reserve At Somerset, give us a call at 317-493-0959. *Equiped w/ several Alexa/Google switches & fireplace. MLS#21632845. RE/MAX Advanced Realty. 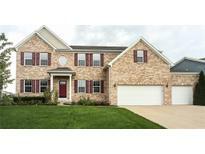 Upgrades: 42" kitchen cabinets, stacked stone gas fireplace, 3 car garage, stamped concrete patio, basement is plumbed for bath, irrigation system, dual zone Heil gas furnace, upstairs bonus room & more. MLS#21627590. Mike Watkins Real Estate Group.